Some may consider Giles Walker is a man ahead of his time. He's been working with robots for the past twenty years... well, not exactly with them, more like on them. As a sculptor, he's experimented with the convergence of movement, recycled materials and music. As a member of the guerilla-art group The Mutoid Waste Company, Giles work with kinetic sculptures continued to develop. In 1993 he founded a robotic rock n' roll band consisting of fourteen robotic musicians called Antibody. 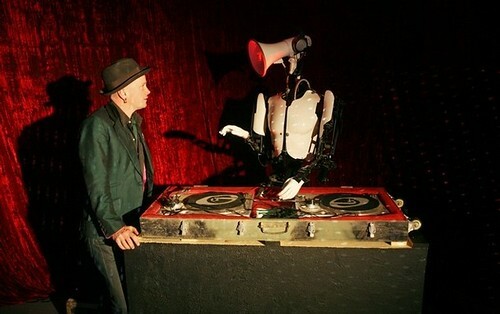 Fast-forward to 1994, when he paired up with rock n' roll legend Ian Dury and began working on Ruby Throat, a project combining performance, music, and a robotic radio-controlled lead vocalist. 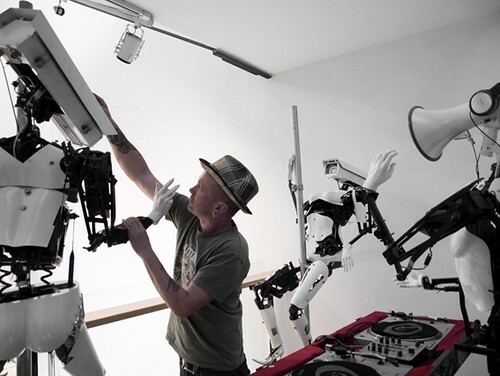 Fast-forward again to 2007, and Giles had built a robotic DJ (DJ Droid) which performed at Tokyo's largest club, Ageha. His most recent project involved building two animated pole dancers which debuted at the Glastonbury Festival last year. Now he's in the planning stages of building three animated 'drunks' which will be placed on park benches and programmed to interact with the public using presence sensors.